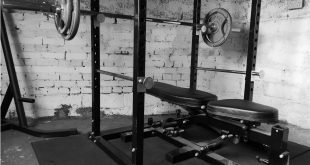 This article covers Basic Anatomy, The Bicep Exercises, some Good Articles and worthwhile Videos. 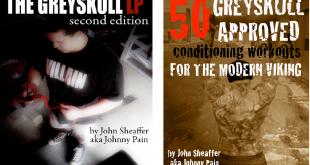 Page two covers the Key Rules of Bicep Training and Sample Workouts. 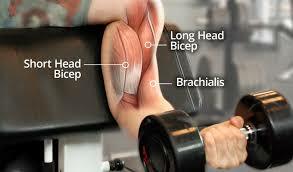 “The “biceps brachii” is the muscle crossing the shoulder and elbow joint. It has two “heads” (“bi-ceps” means “two-heads”), the long head and the short head. The short- head (inner) of the bicep is where you will find most of the mass/bulk of the muscle and the long-head (outer) is what actually creates the ”bicep peak”. When flexing the bicep muscle the long-head (outer) actually rises up and sits on top/above of the short-head (inner). So achieving muscle hypertrophy (increase in muscle size) in the bicep long-head will create a bigger bicep peak. The Brachialis is a third muscle of the upper arm, and is deeper and less visible. It assists the biceps in elbow flexion, and shouldn’t be neglected in training. 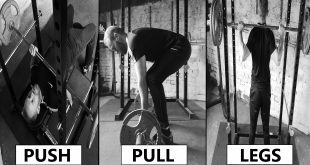 Depending on your own body, you could respond best to high rep, low rep or a blend. Experiment with each. 10 reps of one exercise super-set with 20 reps of another. 10 total sets. 5 reps DB curl, 5 reps hammer curl, 5 reps cross-body curls, then drop set again. Bicep-tricep superset, 20 reps of each exercise, 7 sets. Video 2 – Two Reasons Why Your Biceps Won’t Grow!